THIS BEAUTIFUL GIRL IN THE CAFE was inspired by my lovely daughter. El Beso Cafe in View Street, Bendigo is a favourite haunt of ours for a coffee, breakfast or lunch - the fabulous fresh food and excellent coffee is hard to resist. 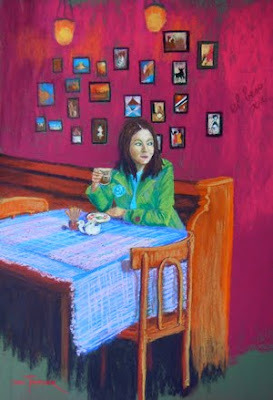 "Morning Coffee at El Beso" is the name of the painting. It is a pastel and is $595.00 and is beautifully custom framed. Now available at the Studio.